Award-winning director and investigative journalist Albert Nerenberg poses these essential questions, asks why the subject of boredom has been so religiously avoided and shows that boredom isn't what you think it is. Prompted by a study that revealed that boredom may actually be a stress condition, the documentary begins with the 2011 London riots, which, although they were started for political reasons, were spread partly by - you guessed it - boredom! According to The Gates Foundation, 47% of US high school dropouts claim they were bored. In 2010, researchers at the University College of London put forth that employees in boring jobs have a 40% higher mortality rate. But what is boredom and where does it come from? Can one really be "bored to death'? And how can you fight it? 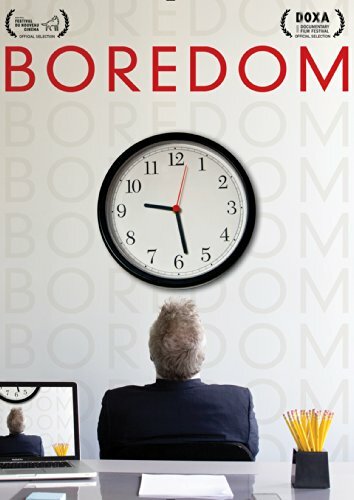 In Boredom , award-winning director and investigative journalist Albert Nerenberg (Stupidity, Laughology, Escape to Canada) poses these essential questions, asks why the subject of boredom has been so religiously avoided and shows that boredom isn't what you think it is. Prompted by a study that revealed that boredom may actually be a stress condition, the documentary begins with the 2011 London riots, which, although they were started for political reasons, were spread partly by - you guessed it - boredom! In this festival favorite called "an absolute must see!" and "anything but boring", audiences will visit The Boring Institute, where cutting edge-research is taking place, meet a woman who can never be bored, discover which common, everyday substance you probably use masks boredom - and much more! Despite the film's satirical tone and entertaining approach, Nerenberg serves up serious food for thought on the evolution of boredom, education and the younger generation, and our relationship with new technologies. In doing so, the lid is blown off the boredom conspiracy revealing a culture that not only tolerates boredom but actually promotes it. and LAUGHOLOGY are the first feature-length documentaries on those subjects. Now, BOREDOM is the first film to expose the shocking facts about boredom! The inventor of the Ultimate Laughter Championships and a frequent keynote speaker on the power of laughter as well as on hypnosis., Nerenberg was the recipient of France's Rire D'Or Award for contribution to the understanding of laughter and has been named one of the 100 most influential people in the world in the areas of health and wellness by greatest.com. On the fiction side, he was the founder of Trailervision, a popular website featuring trailers for movies that don't exist, which CNN called an "international cult phenomenon". He has directed for such major broadcasters as Dreamworks SKG, the CBC and CTV and has been the subject of retrospectives at the Cinemateque Quebecoise and the Just For Laughs Festival. Nerenberg is currently organizing the European and American Laughing Championships. New York City-based TDC Entertainment is a diversified home entertainment distributor headed by longtime industry veterans Gary Baddeley and Dan Gurlitz. TDC combines the distinctive film collections of three label imprints: disinformation(R), True Mind and Shelter Island. With a focus on films that cover social, political and environmental issues, as well as subjects that range from ethics and health to personal growth and history, TDC's highly acclaimed library includes Robert Greenwald's political documentaries such as Unmanned: America's Drone Wars, Wal-Mart: The High Cost of Low Price and Outfoxed, the Emmy(R)-winning film Journey of the Universe, and the compelling issue-oriented docs Tapped, Killer at Large, Greedy Lying Bastards and Unacceptable Levels, as well as the best-selling Parents Choice Award-winning instructional series, Drawing with Mark. For more information, visit TDCent.com.